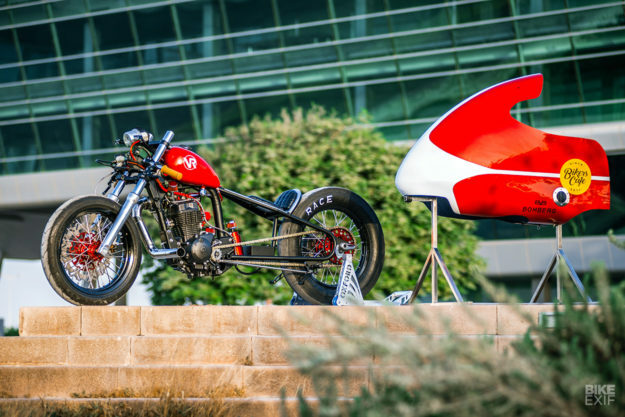 The Persian Gulf custom scene is small, but outposts like Bikers Cafe are working hard to change that. 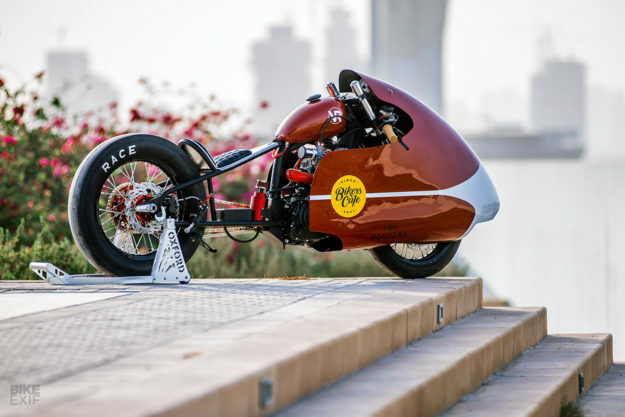 Every year, the Dubai joint gives three brand new motorcycles to local customizers for their annual build-off. Here’s the winning entry, courtesy of Marc and Alan at VR Customs. 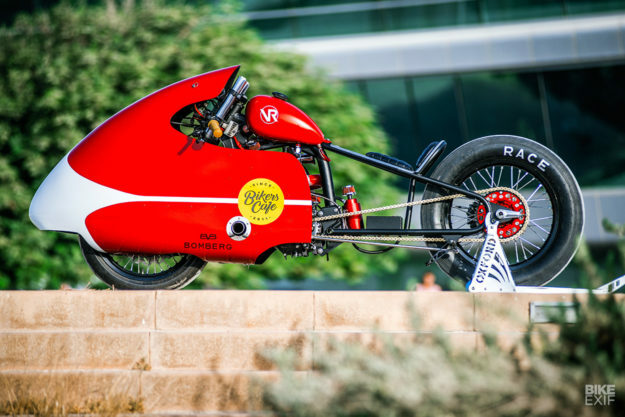 Starting with what’s essentially a pizza delivery bike, they decided that ‘hard tail retro drag bike’ was the way to go. And they were right. 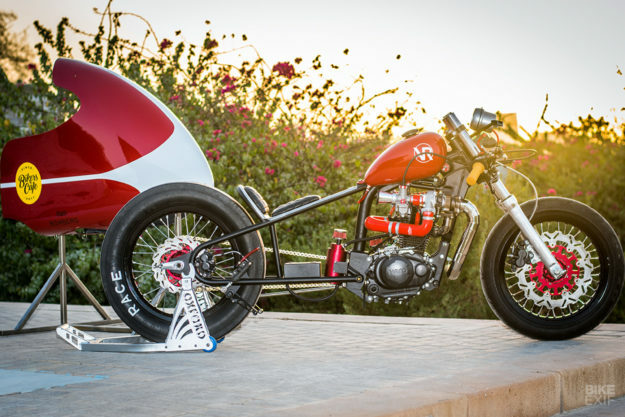 Even though this Xtreme 150 won’t quite do an 11-second quarter mile, it’s by far the coolest delivery bike we’ve ever laid eyes on. Then there’s that hardtail rear end. The guys had the pipes bent at a friend’s workshop, then assembled and welded them back at their own space. There’s also a lot of finessing that you can’t see—like a host of new brackets, and a redesigned lower engine mount. As per the rules, Marc and Alan left the motor’s internals alone—but plugged in a few go-faster goodies. These include a PE30 Keihin carb, and a turbocharger designed for smaller bikes. Peripherals like a silicon intake pipe, and a new oil tank and pump, were added too. The Hero rolls on a veritable smörgåsbord of borrowed parts. The front forks and brake caliper are from a Suxuki GSX-F750, with a 17” Honda CRF supermoto front wheel. The rear wheel’s a combo of a Honda CRF supermoto hub and an 18” CRF MX rim. The Hero’s front caliper is now on the back wheel, with CRF wavy brake discs at both ends. Several brake adaptors and wheel spacers had to be machined up to get everything to play nice. 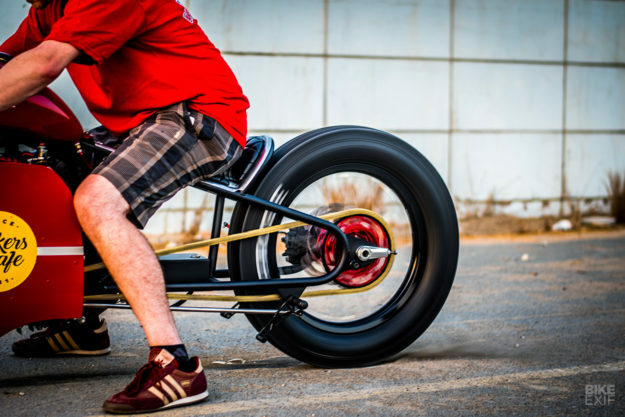 The tires are a Metzeler Racetec in front, and an M&H vintage drag slick out back. 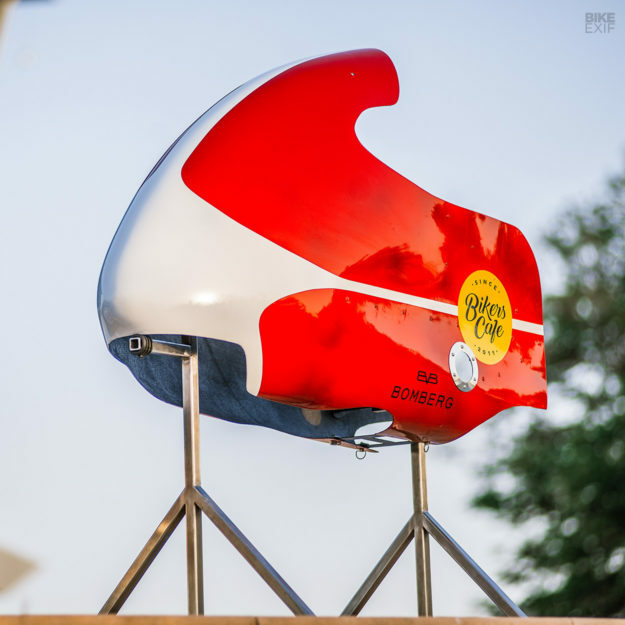 The fairing is a modern replica of a 1950s MV Agusta design. It needed a little trimming to help it fit the bike, and the lads had to figure out a way to mount it. 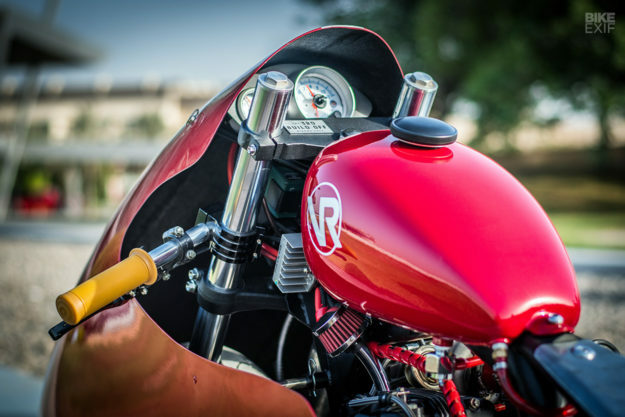 “We used 2mm stainless plate inside the fairing, and then 10mm stainless tubing from the fairing onto the bike,” explains Marc. 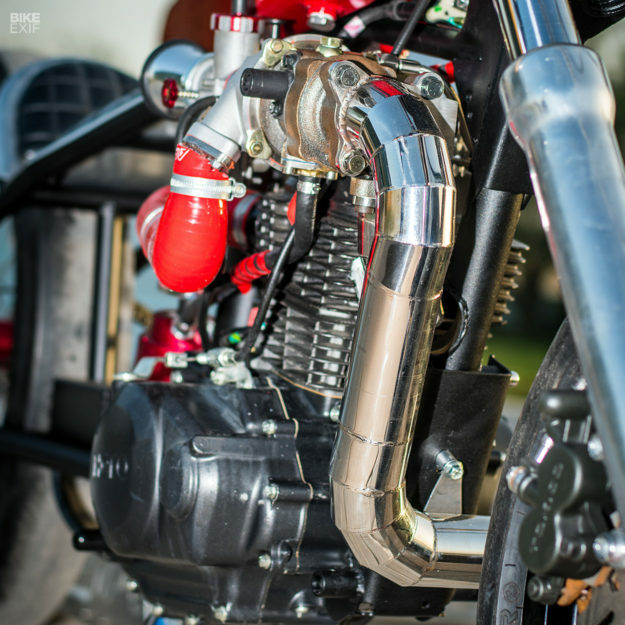 “We then welded bushes onto the bike to slot the tubes into, with R-clips to secure in it place. It takes about one minute to remove the full fairing from the bike.” There’s also a hole on the left where a new, custom-made exhaust system kicks out. Neat! The only other bodywork on the Hero is a two-gallon peanut tank. Alan originally sourced it for another project, but it wasn’t quite right—so it ended up lying around until the guys decided to repurpose it here. It didn’t fit over the frame rails though, so it had to be cut-and-shut with a wider tunnel. Just behind is a seat pan that Alan shaped by hand, capped off with a seat pad borrowed from a Honda CB750 café racer. 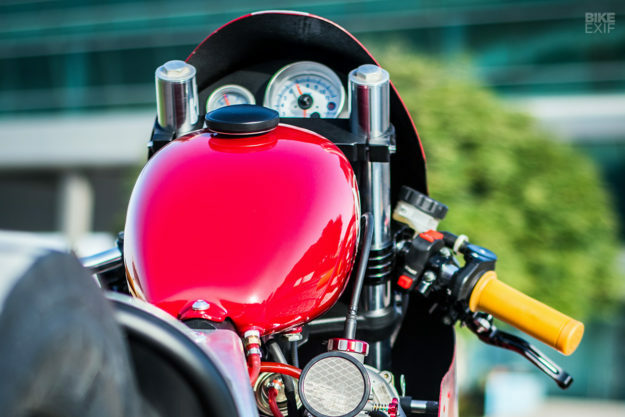 The rider’s ergonomics are pure drag, thanks to a set of aftermarket Triumph Bonneville rear sets and billet clip-ons. 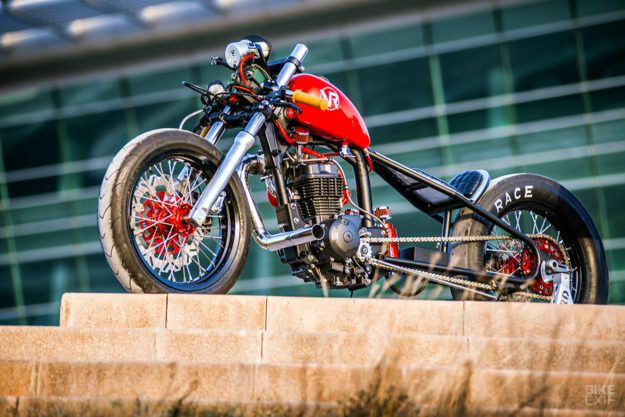 The list of miscellaneous mods is endless: a Triumph 675 rear master cylinder, custom triple clamps and steering stops, a new gear shift linkage, a throttle tube from a two stroke, and braided brake lines. Tacho and boost gauges are mounted in a custom-built dash behind the fairing, with a pair of Biltwell Inc. grips rounding out the cockpit. Is all of this overkill for such a small bike? 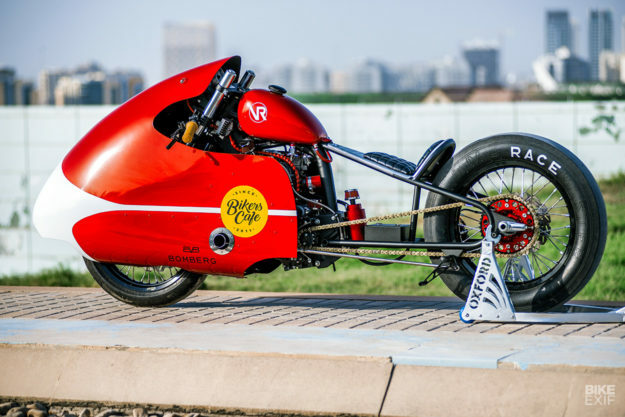 Probably—but VR Customs’ Hero looks damn cool, and bagged them that trophy. Plus the guys intend to have a little more fun with it, as soon as it’s fulfilled its promotional obligations.